AUTOPULIT is specialized in the manufacture of automatic machines for polishing, belt grinding, deburring and micro-finishing metal pieces. At the EUROBLECH 2014 Fair, Hall 13, stand C36, the company will present the latest technology in robot, which is part of its wide range of manufacturing. 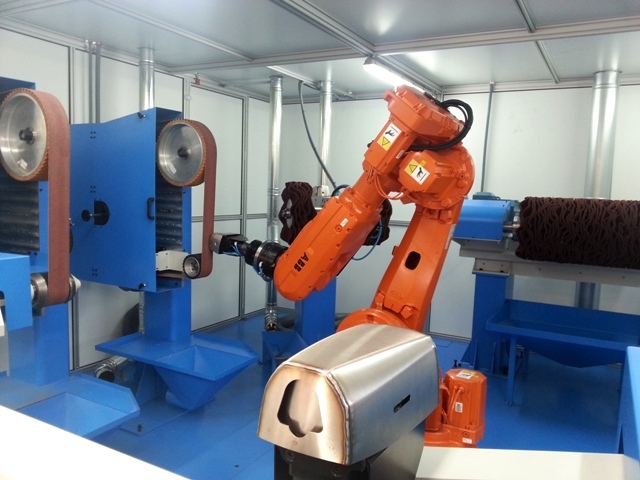 The exhibited robotic cell, Model CR/UL+UP, is a high-tech and flexible installation for deburring, belt-grinding and polishing complex pieces in a totally automated way and with several hours of unattended operation. It is composed of an articulated robot with 6 degrees of freedom (6-axis) and loading capacity from 45 to 200 Kg., working units and parts magazine.